You can import users to Jamf Pro from Apple School Manager. This allows you to automatically create new users in Jamf Pro from the users in Apple School Manager or append information to existing users in Jamf Pro. 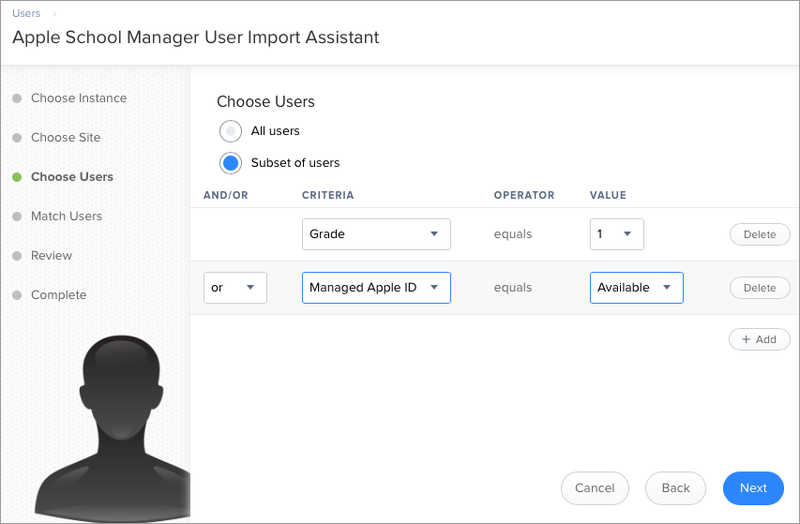 An assistant in Jamf Pro guides you through the process of importing all users or a subset of users from Apple School Manager. If you choose to import a subset of users, you need to choose the criteria and values for the users you want to import. For example, you could import the students from an "Addition & Subtraction" course or an "Algebra" course only. Match to an existing user in Jamf Pro —Imported users are matched to existing users in Jamf Pro based on the criteria selected when integrating Jamf Pro with Apple School Manager. (For more information, see Integrating with Apple School Manager.) Jamf Pro displays potential existing users in Jamf Pro that match the specified criteria. When you select an existing user in Jamf Pro to match the imported user to, information is populated in the Roster category of the user's inventory information. If this information existed prior to matching the imported user with the existing user, the information is updated. Create a new user in Jamf Pro —If you choose to create a new user, the imported user is automatically added to Jamf Pro in the Users tab and inventory information is entered in the Roster category of the user's inventory information. Note: The number of users you can import and match varies depending on your environment. Importing a large number of users at once may affect performance. You may need to perform more than one import to import all users to Jamf Pro from Apple School Manager. After users are imported, if an Apple School Manager Sync Time is configured for the Apple School Manager instance, user information is updated automatically based on the scheduled frequency and time. For more information about configuring the Apple School Manager Sync Time, see Integrating with Apple School Manager. Leave the search field blank and press the Enter key. If you choose to import a subset of users, choose the criteria, operator, and values to use to define the subset of users to import. Note: When importing a subset of users based on multiple criteria, choose "or" from the And/Or pop-up menus if the criteria are the same. Follow the onscreen instructions to import users. Note: If you are importing a large number of users (e.g., 10,000), a progress bar is displayed in the assistant during the import process. You can click Done and perform other management tasks while the import takes place. User information is imported to Jamf Pro and applied in the Users tab. If you have site access only, users are imported to your site only. Find out how to create classes in Jamf Pro for use with Apple's Classroom app. Get step-by-step instructions on how to integrate with Apple School Manager to support Apple's education features with Jamf Pro.